We are two weeks out from the start of the 2018 legislative session! As you know, this will be a very shortened session, not even lasting thirty calendar days, and even fewer legislative days. This means that we have to act fast as we make our push on Stand-Your-Ground law! To do that, we are hoping to drop off a massive pile of petitions from gun owners in Wyoming at the very beginning of the upcoming session. With thousands of gun owners having already signed their petition, I hope you will as well! More on that below. 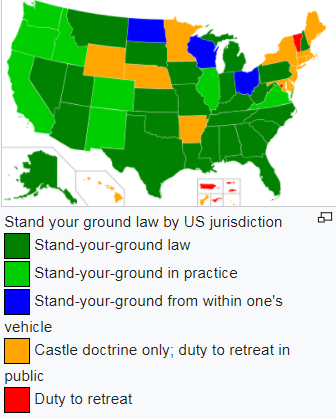 As a reminder, Stand-Your-Ground law is a very simple concept that would simply remove the duty to retreat that currently exists here in Wyoming, before you can defend yourself from an armed criminal! As insane as it sounds, Wyoming is one of only a few states that hasn’t already enacted this life-saving legislation. After all, if you are facing a life and death situation, the last thing you should be thinking about is ‘have I retreated enough steps’ before defending yourself! This common sense legislation is sweeping the country, as Missouri and Iowa have enacted this legislation in just the past two years. What’s more, it’s being considered in states like Minnesota, Ohio, Wisconsin, Nebraska and others this session. But as we all know here in Wyoming, our legislature is extremely moderate and very unwilling to advance gun legislation without being pushed. And that’s why I am counting on your signed petition, to send a message to the politicians in Cheyenne that we are not playing games — that we expect them to pass this legislation this year! >>> The establishment of criminal immunity language which states that if the underlying shooting was justified, you cannot be prosecuted for not retreating before defending yourself. >>> A similar civil immunity protection which states that if you were not charged or were found ‘Not Guilty’ in criminal court, you cannot be civilly sued. >>> Language that clarifies ‘third party’ defense here in Wyoming, allowing you to defend your friends and family, just like you could defend yourself in an attack. That’s why it’s so essential that we pass this bill here in Wyoming, to protect law abiding gun owners from being abused by the system as some already have. That starts with making sure the legislature knows that gun owners are organized and ready to hold their elected officials accountable! Nothing says that like a mountain of petitions in Cheyenne the moment they gavel back in, in two weeks. Wyoming is at a crossroads. While being led by a legislature that professes their loyalty to the Second Amendment, as you can see from the image below, our laws certainly don’t reflect that. Shucks, even California has better self-defense laws than we do here in Wyoming! California! After the legislature killed House File 136 last year, and the Governor vetoed House File 137, it’s up to them to prove to you and me why they should be re-elected. That’s why the upcoming session is so important! That’s also why I am hoping that in addition to your signed petition, you will make a donation to help Wyoming Gun Owners lead this major fight. We are trying to put a budget together to cover direct mail, massive numbers of emails, social media work, and even radio and TV ads if we can afford it. But WyGo doesn’t run on the support of an out-of-state billionaire like Michael Bloomberg, like so many gun-control groups do. We run on an all-volunteer staff, and only by the support of gun owners like you. So if you can make a major investment in this fight of $500 to $1,000, we would be very grateful! But I would be equally thankful if you can donate $250, $100, or even just $50 right now! I know that’s a lot, but the stakes are high this session. If that is simply not possible, please just do what you can right away! Either way, please sign your petition right away, as we’re just two weeks away from the start of the 2018 legislative session. P.S. With the 2018 legislative session just two weeks away, I need all hands on deck as Wyoming Gun Owners is trying to enact Stand-Your-Ground law during this shortened session! We are planning to drop off a mountain of signed petitions in the opening days of the session! Make sure your name is on this list, by signing your petition right away! Between this being an election year, as well as being a shortened session, I hope you’ll be generous with your financial support as well so we can activate gun owners with mail, email, Facebook, and radio/TV ads! Any amount you can contribute would be put right to use here in Wyoming, so please act fast!